Mother’s Day Painting Events at Pinot’s Palette – 3 Sessions w/Free Mimosas! Subject: LongIsland.com - Your Name sent you Event details of "Mother’s Day Painting Events at Pinot’s Palette – 3 Sessions w/Free Mimosas!" This Mother's Day painting is heartwarming and fun! 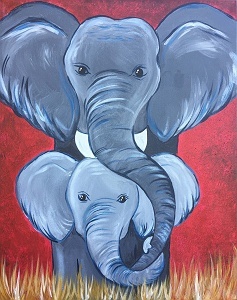 Our adorable mama and baby elephant express a mother's love, and you can too when you and mom come to paint it! Free mimosa for every painter! This Mother's Day bring mom somewhere where she can have fun...and a free mimosa! 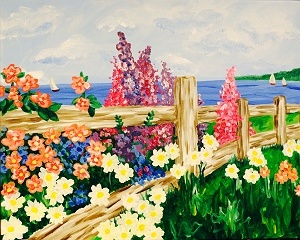 Our “Where the Heart Is” painting is a beautiful floral summery scene. Bring mom and we'll supply the mimosas! 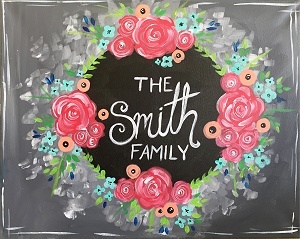 Enjoy a delicious Mother's Day dinner on the town and then come relax for a few hours and paint your own customized family floral wreath. Free mimosa (MOM-osa) for every painter! Bring the whole family, and customize to be the colors you love.